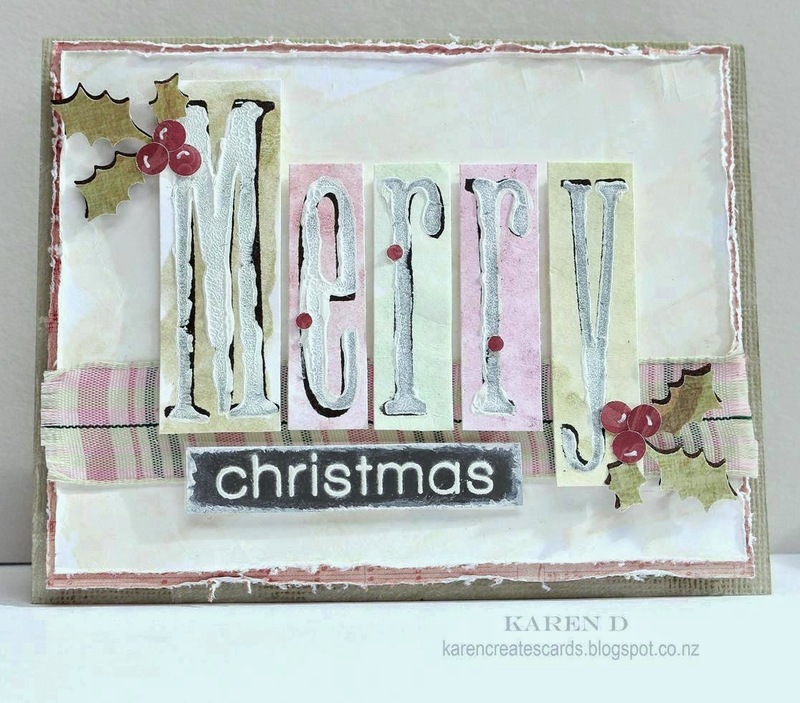 Karen Creates Cards: Merry Monday Christmas Card Challenge #105 - Use a word or words and decorate each letter on your Christmas card. 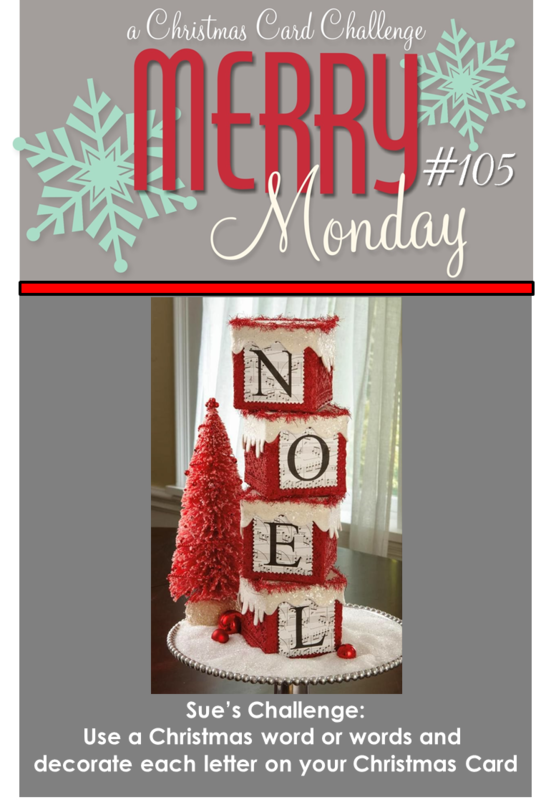 Merry Monday Christmas Card Challenge #105 - Use a word or words and decorate each letter on your Christmas card. Hi there! I hope you all had a wonderful Easter :-) Have you promised yourself never to eat chocolate again? I haven't had an egg, but have to admit, it is not for health reasons. LOL I only eat dark chocolate that is kept in the fridge or freezer. My favorite egg is a dark chocolate marshmallow Easter egg, but I haven't been able to find them for some years! So I am safe. I decided to go a little shabby this time. I have always thought myself to be a shabby girl at heart, but the cards I have made in the last year have a much 'cleaner' look....hmmmmm????? The base card is sage Bazzill, I have inked the edges with white pigment ink. The pink layer is a music DP, and the white is Neenah that has had a little Golden fluid acrylic cream and white paint scrapped over them with a palette knife. The edges are distressed with a Making Memories distressing tool. I have several foam alphabet sets from Making Memories purchased eight or so years ago. My favorite is the Philadelphia alphabet, it has upper and lower case. On a piece of Neenah I inked five 'bars' of watered die ink. I stamped the letters, firstly in black Versafine, then overstamped with a good layer of white acrylic paint. I love the effect. I cut out each individual letter and mounted them on foam. The holly leaves and berries are from hand punches, and the sentiment is SSS. See what the design team have created to inspire you by going to the challenge site (link above) or by clicking on the links below. Clean or shabby... you make it look fabulous! I love me some shabby! 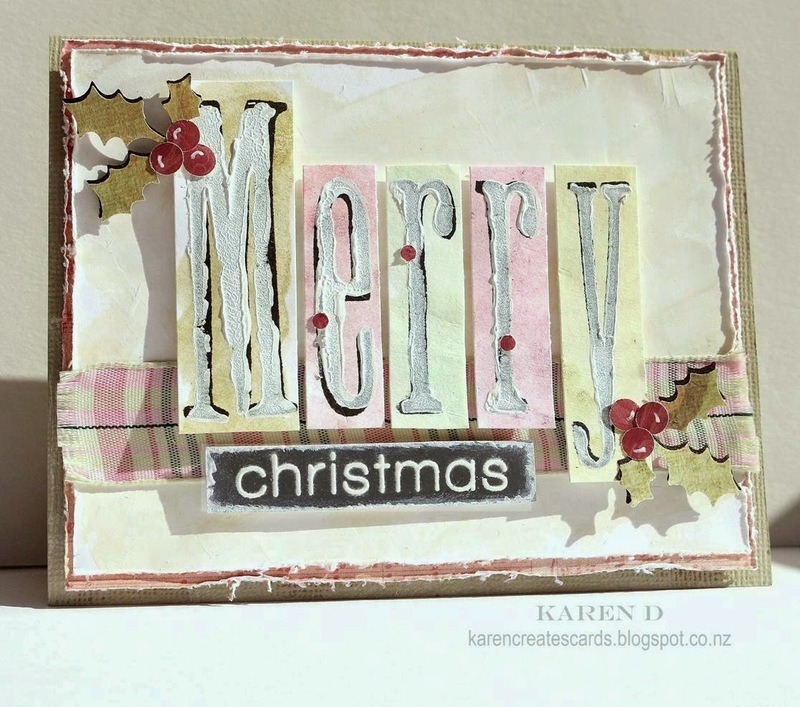 Your card is stunning Karen, looks like you do shabby all the time with this masterpiece! Wow, Karen, this card is so cool! I love it :) You make it appear so easy and fun! Erm.... Wow. I mean really, Karen this rocks. Looks like fancy mixed media home decor. Can I please get one in a 2ft sign for my wall? Lol! Wow, Karen, very shabby chic with an accent on chic! Awesome! Karen! 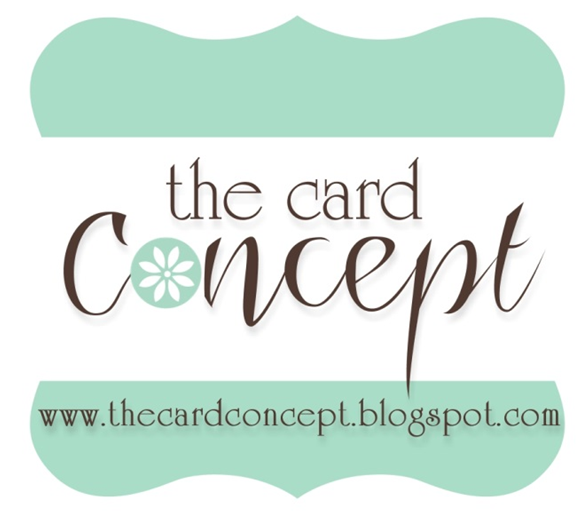 Your card is AMAZING - love, love, love it!! Wow…stunning!!! Not even sure how to say how much I love this card! Beautiful colors and so pretty. This is one impressive card, Karen! I'm so impressed with your letters! I'm pretty sure I've got that alphabet somewhere too! Hi Karen,I love this new look for you.the letters are amazing,and the soft look so pretty . Such an amazing card, Karen! I love all the wonderful details! Just beautiful! Gorgeous "Merry" Karen!!! Love the soft colors....perfect!